Year Round beers available in restaurants and grocery stores throughout California, Arizona, and Colorado. This beer is the freshest to taste and the easiest to drink among the others we offer, and also happens to be the best selling one. By using over 200lbs of fresh blood oranges in every batch, we came up with a beer that explodes with flavor, yet balances its sweetness with just a pinch of tartness. It is this balance, combined with an extraordinarily light wheat body, that makes this brew perfect for any occasion, any time of the year! In 2017, Blood Orange Wit took home Gold in the Belgian Style Fruit Beer category at the Great American Beer Festival (GABF). For those of you unfamiliar with GABF, it is the most prestigious competition in beer. At the time we won, it was also the largest beer competition in history with multiple thousands of entries. To take home any medal would have been amazing, to take home a gold was a pipe dream, so to take home a gold with our flagship beer Blood Orange Wit was absolutely incredible! New to the line up is this super easy drinking Blonde Ale. Incredibly smooth and refreshing, this is the go-to beer for our own Brew Crew after a long day in the brewery! Blonde Ale is widely avalible on draft, and be on the look out for cans hitting shelves around you soon! 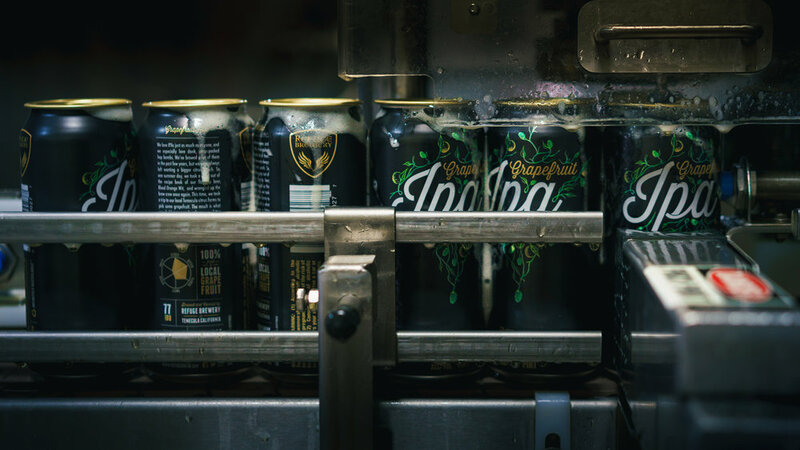 We love IPAs just as much as anyone, and we especially love dank, citrus-packed hop bombs. We’ve brewed a lot of them in the past few years, but we were always left wanting a bigger citrus punch. So, one summer day, we took a page out of the recipe book of our flagship beer Blood Orange Wit, and decided to add fresh citrus to the brew. We wrangled up the brew crew once again and took a trip to our local Temecula citrus farms to pick some grapefruit. The result is what we have here; a bitter, hoppy IPA infused with real grapefruit juice, fresh squeezed by yours truly! The West Coast is known for massively hopped citrus-forward IPAs. A typical Irish-Style Red Ale is a balance of mildly toasted malts. Both styles are great in their own right, but together, they can be something special. So, we took our well-loved Rampart Red Ale and dry hopped it with a pound of Cascade hops per barrel! The Cascade hops blend notes of floral grapefruit with the light toasted flavor of the red malts for a beer that's incredibly well balanced. The core recipe behind West Coast Red dates back to the first weeks of Refuge, and it's always been one of our favorites. The Tap Room is situated in our original suite right next to the brewery. It allows visitors to have an unforgettable beer experience and see what goes into producing it. Our patrons often get front row seats to watch the actual brewing process as our brewers are working. The Tap Room is unique because it truly lets you be a part of the brewery. At any time, we offer up to 20 different beers on tap, many of them are barrel aged in the used whiskey or wine barrels. The tasting room is used as the ground floor for prototyping new beers. It's not uncommon for us first to serve up small prototype batches to our patrons before we decide to brew large scale production batches! A NIGHT OF MUSIC AND GOOD BEER! Join us for a night of amazing beers and music by Mark Nielsen. 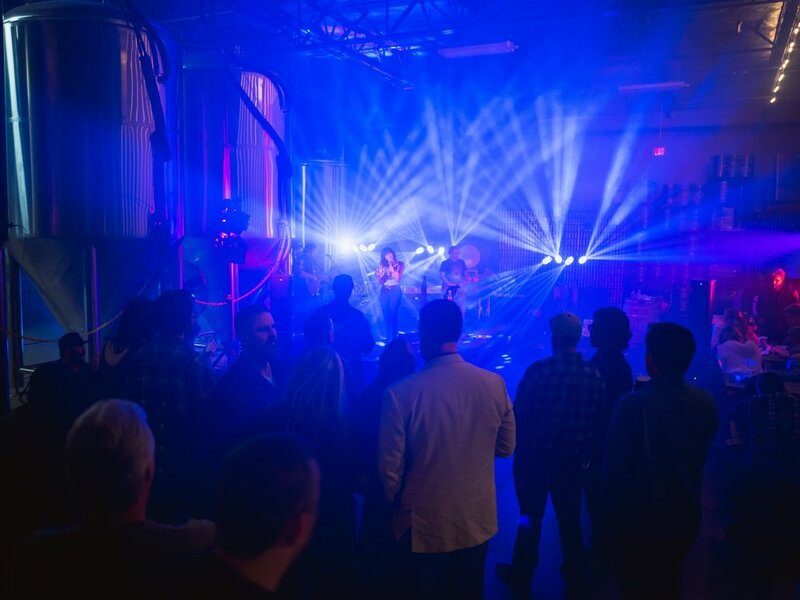 Want to rent Refuge Brewery for your wedding rehearsal, company event, or birthday party? Contact our Events Team and let's plan it! We came up with the notion of opening a brewery while homebrewing one Saturday morning in Curt's garage. We had one simple idea we wanted to live by. Take the ideas and concepts of old world Belgian breweries and blend them with modern brewing techniques and styles. The result is a brewery full of unique beer, brewed without traditional rules, and often using fresh seasonal ingredients. It took months of long nights and hard work to build the brewery (originally just the suite that is now the tap room), but in December 2012 we officially opened our doors. We had a stubbornness to build everything our self and this mindset went all the way to Curt designing his own brewing equipment. This would ultimately be the starting groundwork for what would become Ss Brewtech the following year. In the coming years we signed on to distribution with Stone Brewing and began to distribute our beers throughout California. Currently Refuge beer (primarily Blood Orange Wit) is sold in over a thousand restaurants and bars throughout Southern California, and is available in the Bay Area, Arizona and Colorado. In 2015, we became the fastest growing production brewery in California with nearly a 300% jump in production over the previous year. In 2016, Refuge became the largest brewery in Temecula and all of Riverside county. That same year we leased the suite next door (11,000 sqft total) to take the brewery to the next level. Three short months after opening the doors to Refuge, the Co-Founders decided to team up with a long term business partner and friend to pursue another passion, brewing equipment design. For years the equipment that home brewers, and in turn pro brewers, were using was sub par. Curt, being a mechanical engineer for the better part of four decades knew he could reshape the industry. Today Ss Brewtech is the leader in Stainless Steel home brewing equipment, and is making huge waves in the pro brewing world by building pilot systems for some of the most well known and respected breweries around the world. Owning Refuge, an independent craft brewery, allows the team at Ss Brewtech to test and prototype on a level not seen in the industry before. On any given day you can see dozens of prototype Ss equipment being tested by the Refuge Brew Crew. If you're interested in getting a first hand look at the Ss Brewhouses or equipment, reach out to Ss Brewtech and we'll see if we can arrange a tour of Refuge . The core of Refuge Brewery's operation is a trio of Ss brewhouses. The beasty 20bbl+ 3 vessel brewhouse is custom sized to brew 30bbl of our flagship Blood Orange Wit, with the 5bbl Brewhouse that brews all non distribution tap room beers, and the new 1bbl brewhouse used for small batch testing.